Desmodium paniculatum plant in bloom. By Frank Bramley. Copyright © 2018 New England Wild Flower Society. gobotany.newenglandwild.org (Accessed 2/2018). Desmodium paniculatum is a perennial herb, slender, erect, 0.6-1.2 m tall, often several stems from the root crown, branched above, nearly hairless, stipules narrow, 0.4-0.6 cm long, soon deciduous. 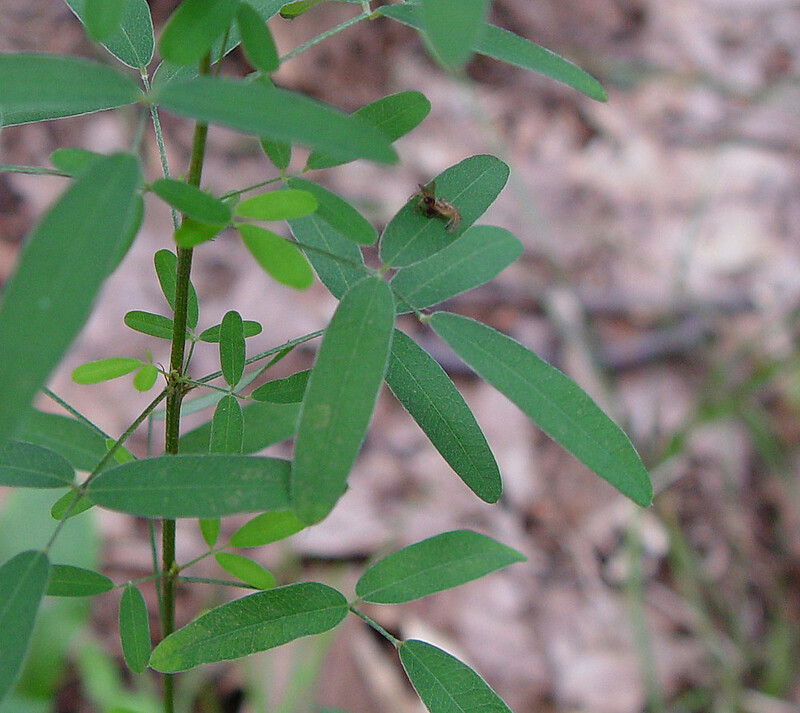 Desmodium paniculatum leaves. By Arthur Haines. Copyright © 2018. New England Wild Flower Society. gobotany.newenglandwild.org (Accessed 2/2018). Leaves alternate, 3-parted, leaf stalk 2-5 cm long, leaflets thin, the terminal one 4-10 cm long, 1-2 cm wide, lateral leaflets smaller, oblong to lance-shaped, tip pointed, base rounded. 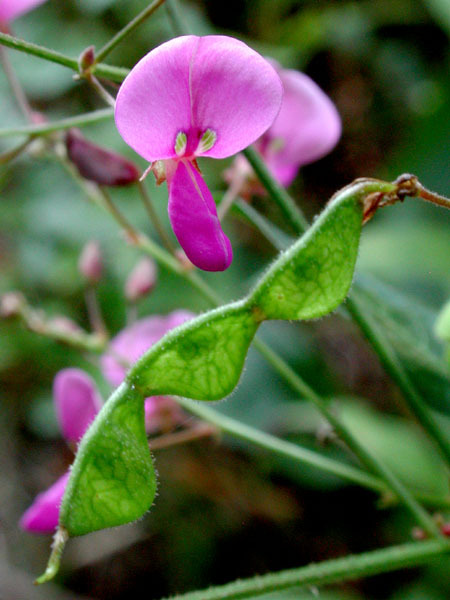 Flowers pink-purple, 0.6-0.8 cm on stalks to 1 cm, inflorescence 10-40 cm long, triangular, large, branched, July-Aug.
Desmodium paniculatum flowers and fruit. Davi G. Smith. Delaware Wildflowers.. delawarewildflowers.org (Accessed 2/2018). Fruit becoming dry, jointed pod, with 3-6 triangular 1-seeded segments, 0.5-0.7cm long, to 0.4 cm wide, surface covered with hooked hairs; dispersed by clinging to fur or clothing (Matlack 1994). 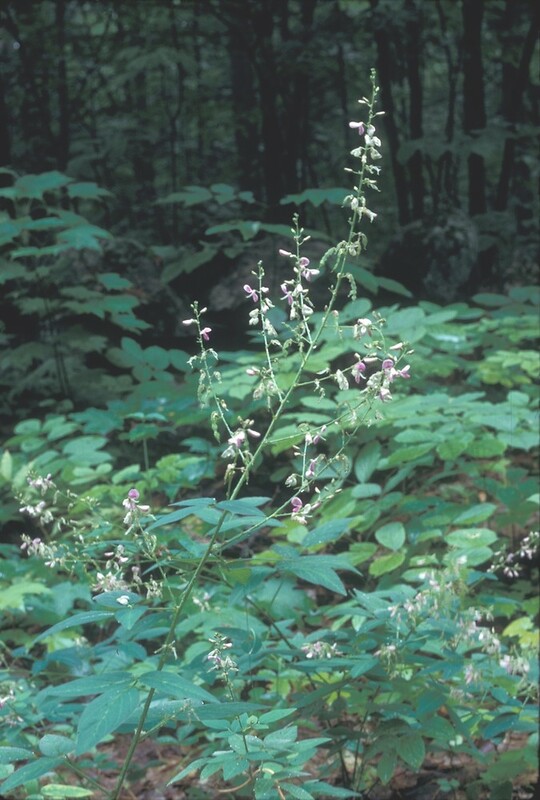 Habitat: Dry woods and edges, somewhat tolerant of shade and drought, soil pH 6-7 (USDA, NRCS 2006).